Spanish Still Life - Velázquez, Goya, Picasso, Miró (Feb 23 - May 27, 2018) is an exhibition at BOZAR dedicated to still life painting in Spain, curated by Angel Aterido. 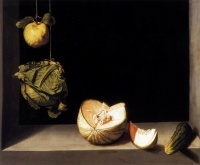 Still life occupies a prominent place amongst the pictorial genres of Western visual art, but is too often seen as an academic exercise in imitation. This ambitious, original exhibition turns this perception upside down with an overview of 400 years of Spanish still lives. Spanish still lives occupy a unique place within the European context, and have an unmistakeable relationship with Flemish and Italian models, but resolutely unique imagery, developed by Sanchez Cotán and his contemporaries. The genre experienced an unprecedented boom in the late Baroque to suddenly become a real battleground for the arts in the twentieth century. In still life, avant-garde notably finds a unique medium for a new experiment: cubism. This exhibition brings together the great Spanish masters to illustrate this breath-taking journey, from Velázquez and Goya to Picasso, Dali and Miró." Unless indicated otherwise, the text in this article is either based on Wikipedia article "Spanish Still Life - Velázquez, Goya, Picasso, Miró" or another language Wikipedia page thereof used under the terms of the GNU Free Documentation License; or on original research by Jahsonic and friends. See Art and Popular Culture's copyright notice. This page was last modified 08:08, 8 April 2018.